The most exciting part of my role was getting to see the good what Make-A-Wish® does in our community and getting to see a wish granted. At our Polo at Sunset event, a charity polo match, a teenage boy was given a trained german shepherd to accompany him to the hospital and to be a lifelong friend. I felt so lucky to be a small part of helping the boy’s wish come true. After working with children’s charities in the past, I had not thought in depth about how working with children with life threatening medical conditions daily would affect me. I was surprised with how emotionally taxing the work was. Some days were easier than others, but something I learned from the staff was that running out of time before a wish is granted never gets any easier. In this position I had to use a many different Liberal Arts skills including critical thinking, creativity, and communication skills within donor relations. Throughout the summer, I was given different projects to work on and had to analyze the task at hand before completing the project. I learned that if I did not fully analyze what I was working on before, the end result might not match the desired results of the project. I also got to be very creative during this summer through projects I worked on for individual donors. I could tailor a specific stewardship piece to fit the interests of the donor. It was enjoyable to think of new ways to thank our generous donors form making customized books to pieces for them to hang in their offices. I also had to work with many different personalities this summer when working with donors. My background in communication taught me how to read their body language and direct the conversation in a way that made the donor feel connected to the organization. This internship prepared me for my career by exposing me to different work environments, showing me how to complete individual projects from start to finish, and showing me how to be a cohesive part of the organization. 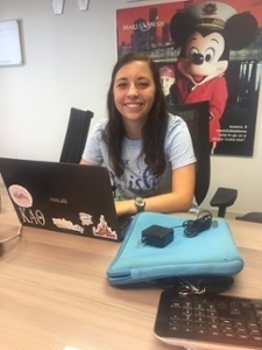 Every day was different at Make-A-Wish, so I got to see how the staff worked in different environments from in-office days to lunch meetings with donors. I was also given individual projects that I was in control of from start to finish, so I got to learn how to pace the project and make sure that the project was up to all brand standards. I worked with the development team, so I learned how to assist all three of my bosses.